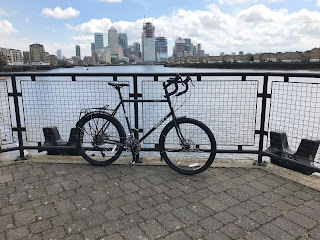 About five years ago, at about the time I was buying my first Brompton and I remember having a go on a friends Surly Long Hall Trucker who was going to use it to cycle 'The Great Divide.' 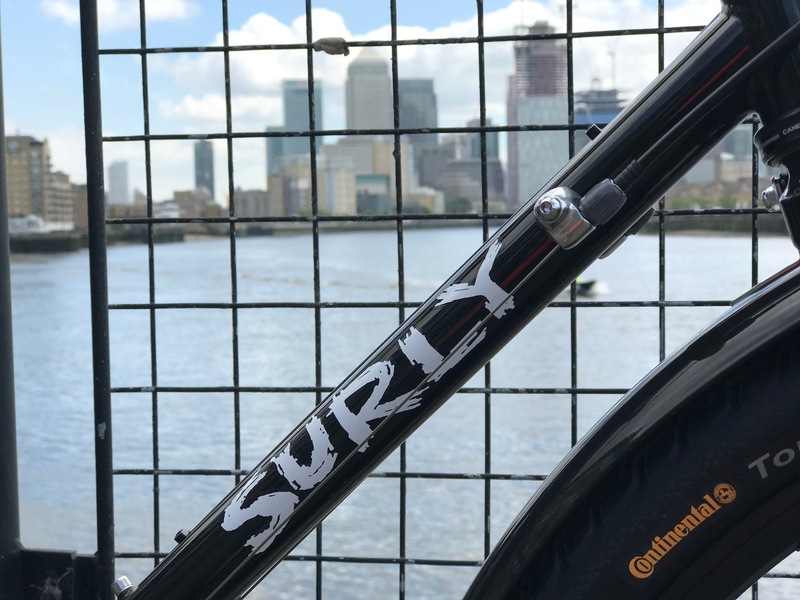 The Surly LHT was so versatile and so customisable that despite being a mountain bike route, his bike was kitted out with wide mountain bike tyres, gearing that could get him up almost any ascent and have front and rear racks to carry all his belongings. He completed 1000 miles of the route that runs from from Canada to Mexico but due to unforeseen circumstances had to cut short his trip. 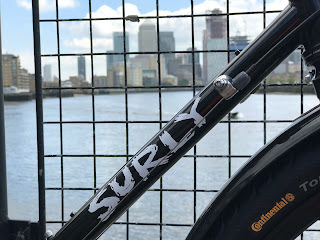 Upon his return his Surly LHT was converted back to a light tourer with different gearing and wheels. I was in awe of that bike...almost intimidated by it if anything and left it there as a grail bicycle. so easily on it. I know that it is a bike a will almost certainly never sell. Wanting something that was a little more rugged and could do road as well as off-road I went on a few night rides with some devotees to the Specialized AWOL. These are steel bikes a little in the lines of the Surly LHT. I really liked them but didn't get any further than that. There are times in life when you make a mistake as far as bicycles go. For me that was a Whyte 629 mountain bike. I had some wonderful adventures on it and even used it to rack up most of the miles needed to complete the Rapha 500 in the run up to Christmas 2016. However, despite its quite wonderful off road prowess, on the open road it felt sluggish and I didn't enjoy it. I found that although I liked it for anything off-road or trail-like, as far as the open road was concerned (which was often how I got to the off-road stuff) it was a bit of a chore. 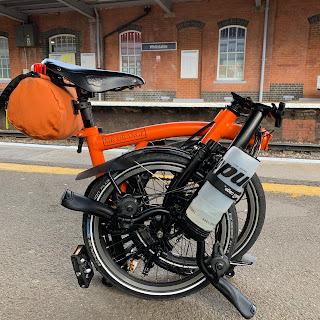 I had to make the decision to sell the Whyte 629 and with that sold and one of my loved Brompton bicycles also being sold - very reluctantly I have to say - I decided to look into buying something like the AWOL or the LHT. 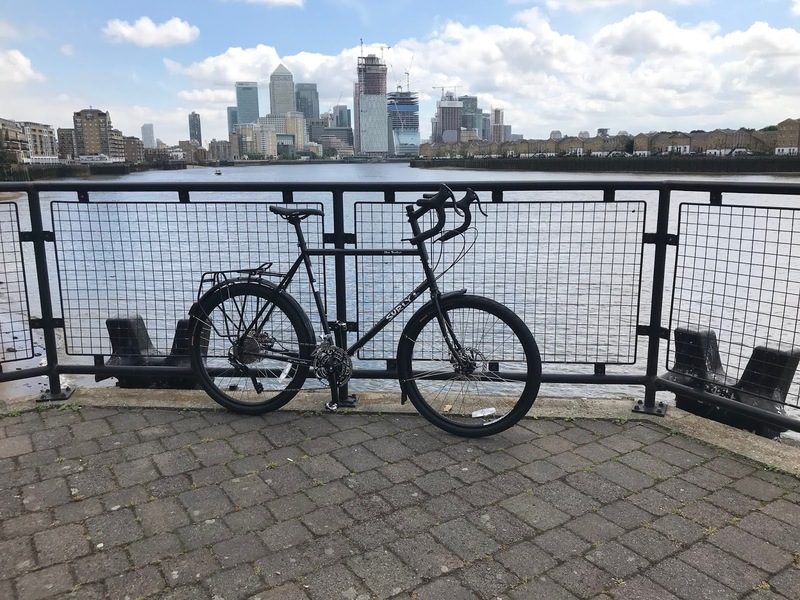 At home I searched for an old Moleskine notebook in which I had written down a few notes about the LHT and sizing and headed off to the quite wonderful 'Compton Cycles' in Catford to test ride a Disc Trucker. Sadly, Compton's didn't have the 26" wheel version but with the geometry of the 700c wheeled version being much the same I tested that instead. I was pretty sure that the bike would fit well as I had tested out my friends version several times. (He still has it and uses it by the way and now lives in Canada). 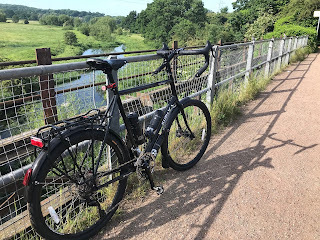 The much more upright riding position, despite having drop handlebars, I found very agreeable and comfortable, more so than on my Condor road bike for which I had a bike fit! The bike had quite wide tyres (wider so on the 26" wheel version I wanted) and I again found them rather good. The gearing was a bit of a revelation. 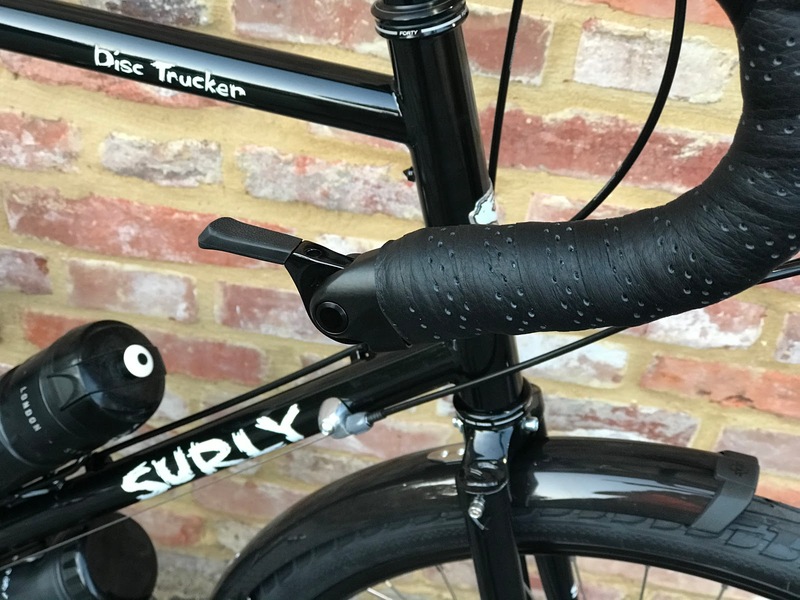 The Surly's come with bar end shifters. The right one is indexed and the left that controls the shifter from one chainring to another is friction fit. I really enjoyed using these and didn't find them much slower than the much more modern Shimano 105's on my Condor. The 11-36t cassette, coupled with the 26/36/48t tripple chainring meant that I effectively had the best of both worlds. I had something to get me up the steepest of hills and yet be able to cruise along on the road at a decent pace. When I got back to the shop I placed and order. On Friday I got an email from Jim at Compton's that the bike was in. 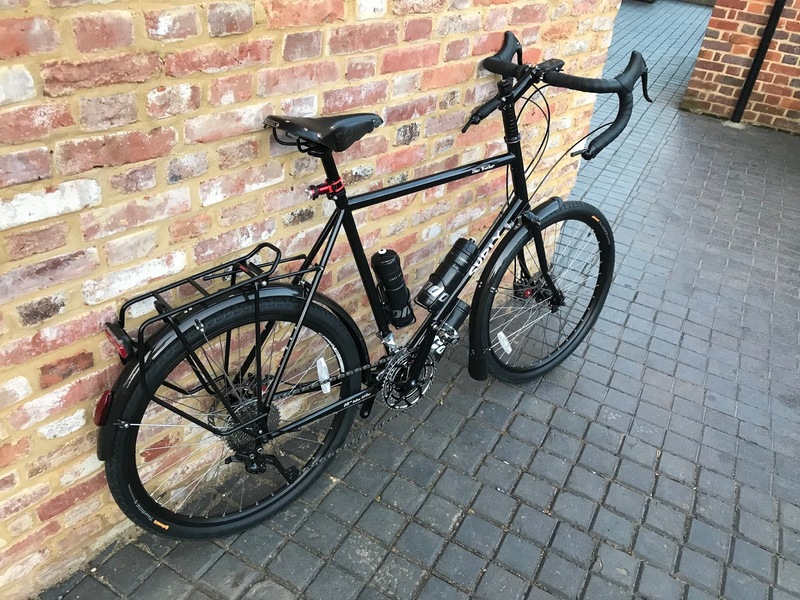 Saturday morning I travelled over to Catford with mudguards and rear rack I had ordered in the meantime and handed them over to Jim for fitting once the bike was ready. Retiring to an establishment that sold tea for a while I returned to find Compton's incredibly busy. Offered a seat while I waited for the bike to be made ready I saw Jim and his team at work. I have to report that if you live anywhere near London, go to Compton Cycles. They are brilliant. There were all manner of customers and enquiries and Jim and his team were absolute troopers! With the bike ready I wheeled it out and decided to head for Greenwich. I don't know why I just set my Wahoo Bolt to navigate me to there and I was off. The bike felt really comfortable and it was as if I were riding a bike I had owned for several years as apposed several minutes! Again I really enjoyed using the bar end shifters - something I thought I would have to change straight away. Arriving at Vicars Hill a fairly steep road it proved to be little trouble for the Surly gearing and I had many more cogs and a whole chainring left in the bag. Once home I mounted the three bottle mounts the Surly posses, a Brooks B17 saddle and some leather bar tape. On the open road I found that the 1.75" tyres didn't really slow things down too much. On the straights I could easily cruise along at over 20 mph. 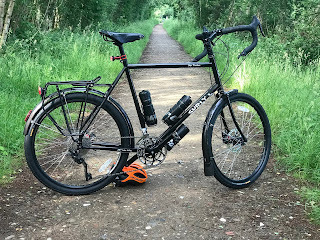 It is not an 8kg carbon road bike but nor it is meant to be. It is possibly 14.5 kilos but hey, I can live with that if I like it as much as I already do. 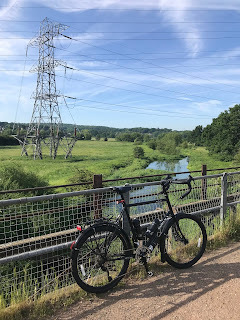 Taking the bike out early this morning I enjoyed almost 10 miles on the open road and 10 miles along a trail - which had the added bonus of being a disused railway track. 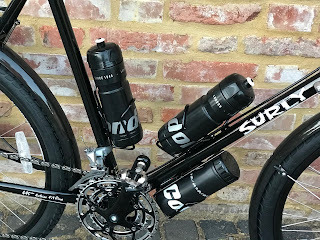 Look up Surly Long Haul Trucker / Disc Trucker on the internet and you'll find people all across the world singing its praises and using it on the most incredible adventures in far flung locations. I am not sure that my one will be taken to places as exotic or remote but its nice to know I could. My Surly Disc Trucker could very well be the most comfortable bike I have ever owned. I am pretty sure that it will take me on lots of adventures as I have already developed quite a soft spot for it! Looks very nice - I'll look forward to seeing it for real very soon! That will be very soon!